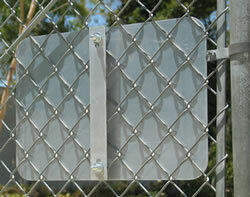 Sign Mounting Bracket and Hardware for Mounting Signs on a Chain Link Fence - 18-inch size. 3/8" Holes 15" center to center. Our 18-Inch Brackets and Hardware are used for mounting Square and Rectangle shaped signage. This 18-Inch Bracket is perfect for mounting 12x18, 18x18, and 24x18 Signs or other 18" tall signs to chain-link fences and meshed security gates. If you are looking to mount a 18x18 Diamond Shape Sign please Click Here for our 24-Inch Sign Brackets.